At Embedded World 2017, hall 4, booth 540, Wibu-Systems will prove how CodeMeter’s protection, licensing, and security technology is serving the embedded system community with the most advanced, modular, and neatly designed architecture available today. Conditions and requirements in the industrial environment are extreme, diverse, and complex. CodeMeter harmonizes this heterogeneous landscape with one unique multi-platform, multi-vendor, and multi-purpose technology. In its constant evolution, CodeMeter offers unparalleled advantages and innovations. In the current transitional phase, hardware is becoming a commodity powered by software features that keep evolving. CodeMeter provides cybersecurity capabilities to intelligent device manufacturers who want to safeguard firmware upgrades and updates, to software publishers that need to protect their intellectual property from counterfeiting and reverse engineering, and to users who want to be sure the software they run is genuine and has not been tampered with. CodeMeter also includes the entitlement aspect, from the creation of licenses, to their online or offline delivery, transfer, or remote management. In doing so, Wibu-Systems supports the migration to a dynamic industrial economy where new license-based business models create additional revenue and responsive pricing models for an unlimited access to the market for all vendors and users. A world premiere: Wibu-Systems will show the first samples of CmStick/CM, the ultra-compact, simple, chic and robust USB stick with full metal housing, high performance flash mass memory, USB 3.1 interface, and a System in Package (SIP) module for the USB connector to withstand intense vibrations, high humidity, and temperature fluctuations. In order to meet the most stringent durability and reliability standards for data integrity, this model, just like all other variants in the CodeMeter stick family, will embed the state of the art in its bill of material: the avant-garde SLM97 security controller from Infineon and Hyperstone’s U9 flash controller and their patented hymap® firmware. It will also come with CodeMeter API for the read and write configuration of a secure area in the flash memory. Industrial architectures often have constraints not just in size, but also in interfaces; that’s why the hardware-based secure elements of CodeMeter also include sticks for vertical assembly on the pcb, secure industry-grade and EMV-certified memory cards (microSD, SD, CF, CFast), and ASICs supplied in 5x5 mm, VQFN-32 packages that are easy to integrate, also thanks to the choice between SPI and USB interface, and able to operate at temperatures ranging from -40° to +105°C. Additionally, Trusted Platform Modules, computer-bound soft containers, user-specific cloud containers, or servers in the LAN or WAN can hold sensitive data protected from cyberattacks. 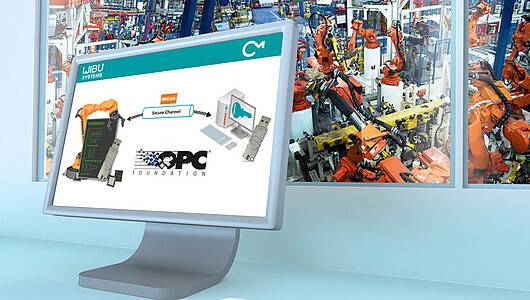 Unique in the market: Manufacturers that develop their automation software based on the OPC UA standard can now avail themselves of a hardware-based solution with the seamlessly integrated CodeMeter Embedded via the internal APIs and abstractions of the ANSI C based SDK. Wibu-Systems’ OPC UA Security Extensions consist of a software library and hardware secure elements that become the safe repository for cryptographic keys, software license entitlement details, and sensitive configuration files. In addition to secure storage, Wibu-Systems has added simpler configuration and management functionalities.